My picks for Thanksgiving 2015 this year are a little bit out of the ordinary. An easy, value-driven French white to start, followed by a California blend from one of my FAVORITE Cali producers - Broc Cellars - and a "new grape" recommended to me by John at Keife & Co. here in New Orleans last weekend. In short, you've got a bright white for pre-dinner, an elegant red for the bird and a rich, silky red to finish up dinner and keep good company with the dessert. Each bottle will run you about $20 or less. At Domaine Reine Juliette, Guillaume Allies makes a picpoul and a syrah-grenach rosé on his small estate in the Coteaux de Languedoc in Southern France. 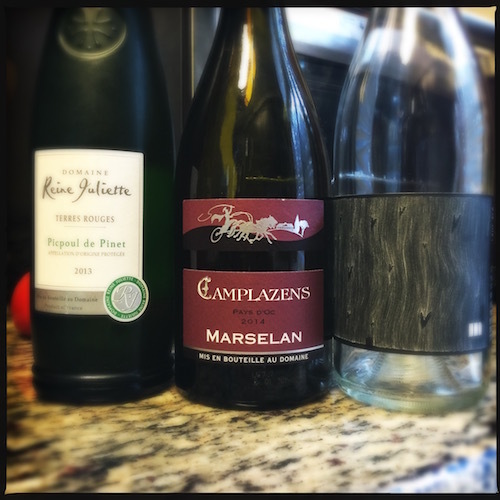 There are actually three kinds of picpouls - blanc, noir and gris - but what we most often see stateside is the blanc, typically labeled as Picpoul de Pinet, as we have here. Super bright acidity and clean, fermented in stainless steel and bottled with the intention to drink young and fresh. Hints of herbaceous notes, grass and sour citrus fruit with a lip smacking finish. The Domaine "Queen" Juliette is a lovely aperitif wine, something to drink down quick while waiting for dinner to hit the table. Broc Cellars is an urban "asphalt" winery, located in downtown Berkley, California, where they make natural wines from carefully managed sites in and around Alexander Valley. They consider themselves a natural winery, dedicated to using only the inherent qualities of the fruit they receive, practicing natural yeast fermentation, never adding powdered tannins or acid, and applying SO2 (aka sulfites) only before bottling. I've loved every wine they've made, and if you like this one, I urge you to seek out the others. The Love red is made from 75% carignan, 14% valdigiué and 11% syrah. That middle grape is an odd one, originally grown in Southwest France, very few vines remain there or in California. Valdigiué adds deep color and interest to this cuvée, which is on the lighter side in body and alcohol, making it a lovely match for turkey. Red berry aromas and flavors with soft tannins, friendly and very easy to drink the entire bottle on your own. Susan and Peter Close moved from their home in North England to take over the vineyards of Château Camplazen in the Languedoc, fulfilling a lifelong dream and raising the quality of the chateau's wines. This wine is made from 100% marselan, a new grape developed in the early aughts in France. It's a crossing of cabernet sauvignon and grenache. It is opaque in color, a deep ruby nearing black with rich aromas of blueberry and blackberry followed by a full body with ripe, sweetish tannins, then hints of earth and iron and a medium silky finish. It's an easy quaff. Hope you have a wonderful Thanksgiving, friends. Cheers!